This is the new definitive text on Etruscan terra-cottas. Although initially intended for the innovative (if prosaic) purpose of providing waterproof and fireproof cover for formerly thatch-roofed homes, fired clay tiles became, in 7th century Etruria and Central Italy, a critical element in domestic decoration. Featuring statues of humans and animals and mythological figures and inscriptions of political messages, the surviving tiles provide important insights into the architectural history of Etruria. 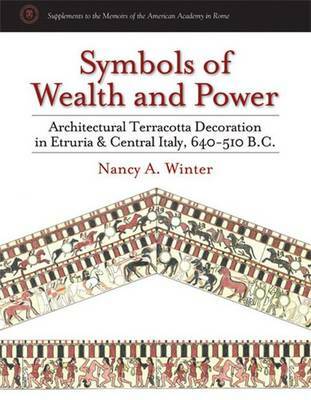 With "Symbols of Wealth and Power", Nancy Winter has provided a definitive catalogue of the evidence of these roofing tiles that will enhance our knowledge of Etrurian - and more broadly, ancient - architecture.